Sen. Ted Cruz at an event for the Federalist Society in November 2016. 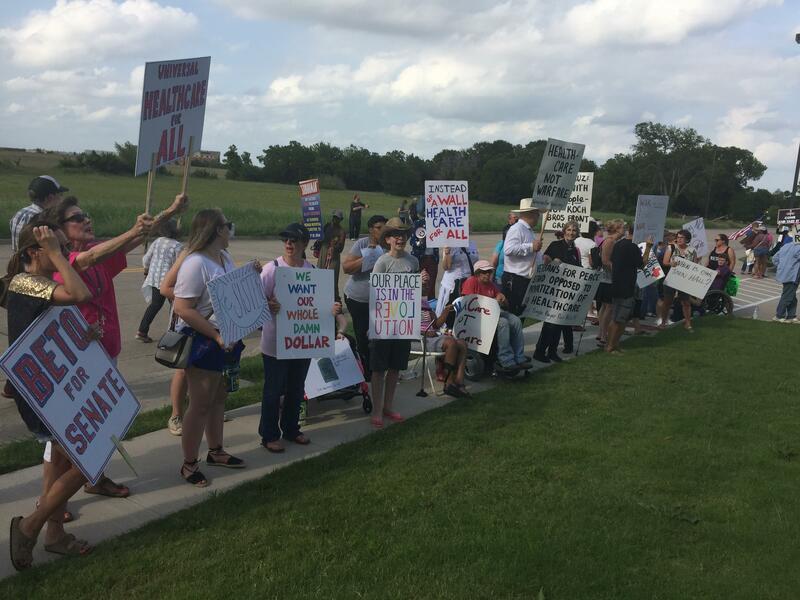 Protesters gather outside Sen. Ted Cruz's veterans event Wednesday evening in McKinney, Texas. One protester held a sign reading "Say NO to Trumpcare," in opposition to the Senate's effort to repeal the Affordable Care Act. Cruz is holding several town halls across Texas during the current congressional recess; he will also be in San Antonio and Austin this week. The audience Wednesday night was mostly veterans who are friendly to the senator. The event was sponsored by the conservative group Concerned Veterans For America. There were just four to five questions from the audience and all were screened in advance. The Texas senator spent much of the event advocating for more health care choices for veterans beyond the VA hospital system. He also reiterated his opposition to the Affordable Care Act but acknowledged that getting the votes in the Senate to repeal it remains a challenge. He was also one of a small group of Republicans to oppose the Senate health care bill, arguing that it didn't go far enough to roll back Obamacare, as the ACA is also known. Cruz said it is critical for Congress to focus on lowering premiums and to "honor our promise to repeal Obamacare — it isn't working and people are hurting across the state and across the country." Sen. Bill Cassidy of Louisiana also faced a confrontational town hall last week. An attendee in Baton Rouge reportedly interrupted his remarks to ask him to "vote against that hideous bill." He said he hasn't decided how he will vote on the Senate's health care bill because he wants to "judge the final product." Republican Sen. Susan Collins, who also opposed the Senate bill, told reporters in Eastport, Maine, that she's been hearing from constituents who are "deeply concerned" about the Senate bill. At least seven more Republican members of Congress and more than 20 Democrats have town halls planned around the country this week, several of which will focus on health care. Town halls became popular and contentious venues for voicing concern over health care in the summer of 2009 when President Barack Obama's Affordable Care Act was being debated in Congress. Many of those gatherings turned into shouting matches and, in some cases, physical fights. Like Moran, Texas Senator Ted Cruz is under pressure from Republican leaders to drop his opposition to their health care bill. At home in Texas, he's had trouble escaping supporters of Obamacare. A veterans' forum north of Dallas yesterday was tightly controlled, but that couldn't stop some questions about the Republicans' attempt to repeal the Affordable Care Act, as NPR's Wade Goodwyn reports. WADE GOODWYN, BYLINE: These days, if you're a Republican U.S. senator holding a town hall meeting or any type of public forum, really, you're pretty much guaranteed a robust liberal entourage. GOODWYN: At 5 p.m. in McKinney, Texas, yesterday, it was Amazon jungle hot with the heat index well into the triple digits. 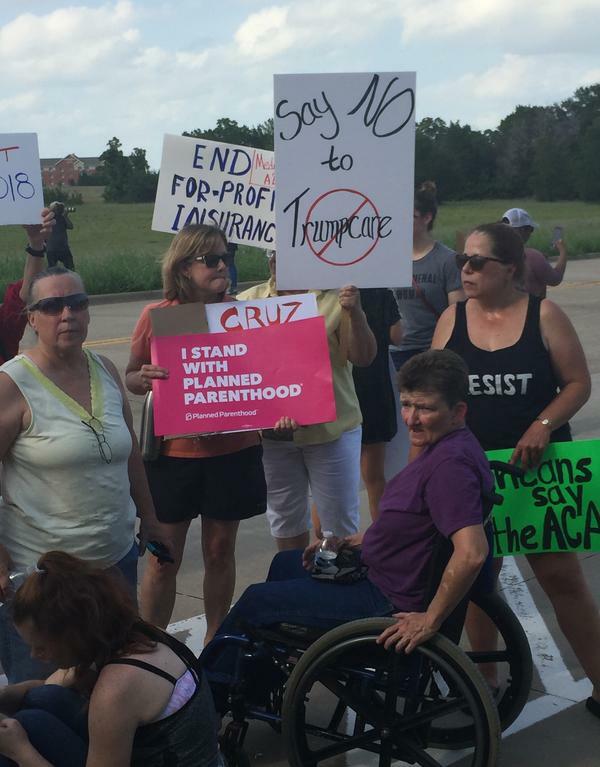 But that didn't stop more than 150 protesters, some with canes and some in wheelchairs, from expressing their displeasure with Ted Cruz. KATE GARRISON: I pay for Cruz's health care. GOODWYN: Sixty-nine-year-old Kate Garrison (ph) sits in her motorized wheelchair fresh as a daisy, not a drop of sweat on her. She's running hot, but it's got nothing to do with the weather. GARRISON: How come he gets the right to rich health care that I pay for and he takes away my right to good health care? GOODWYN: Inside the Sheraton Hotel, Dennis Noonan (ph) is not a whole lot happier. He sits dejectedly in the hall outside the ballroom where Senator Cruz is appearing. Noonan's a big Cruz supporter and served in the 101st Airborne in Vietnam in 1969. DENNIS NOONAN: I heard on the radio today that the senator was going to be here and was going to have a chance to communicate with the vets. And I find out now that I can't get in because I didn't pre-register. GOODWYN: When it comes to the health care debate, Noonan stands with Senator Cruz - repeal Obamacare. There's one significant difference, however. Noonan wants to keep the regulations mandating insurance coverage for pre-existing conditions. Cruz doesn't. NOONAN: My wife just found out she's got breast cancer. She's going to have a double mastectomy in the next two weeks. After that, she's going to be a cancer survivor. But she'll always have cancer on her record, and so getting insurance for her now will be very difficult. GOODWYN: Attendance for the event was controlled by Concerned Veterans for America, a conservative Koch brothers-funded group, so there were plenty of people inside the room who were in complete agreement with Cruz's health care positions. Take May Tolson (ph) from McKinney who doesn't think the Republican bill in the Senate is anywhere near conservative enough. MAY TOLSON: I am not a conservative who says, oh, let's just pass it 'cause the Republicans say so. I don't think it's going to solve anything. I really think we need to start over. UNIDENTIFIED MAN: We're very happy to have him here. So with that, I'd like to welcome Senator Cruz to the stage. GOODWYN: By the time Ted Cruz finished chatting with the moderator, there wasn't much time for the pre-approved questions. But there was one woman who got in an anguished query about the health care fight in D.C.
MISTY HOOK: You all on the Hill are scaring the living daylights out of us with the health care nonsense that you're doing. GOODWYN: Dr. Misty Hook is a psychologist who treats veterans the VA hospital sends her way whenever it's overwhelmed by sheer numbers. HOOK: When you have things saying that the insurance companies can opt out of paying for health care, mental health care, then who's going to pay us to do that? And we have to get paid. We can't just provide services for free. And so what are you going to do to help make sure that mental health care services are reimbursed at a proper rate so that we can continue to provide services for veterans? 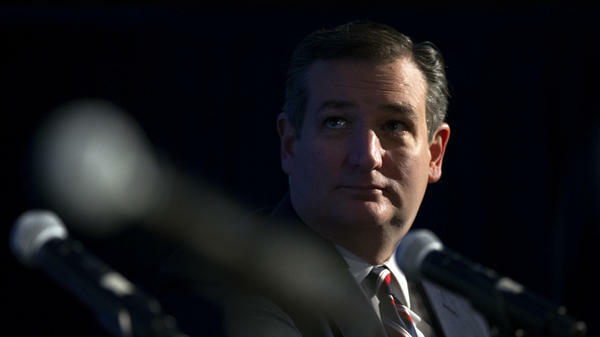 GOODWYN: Senator Cruz responded that in his opinion, Obamacare is an unmitigated disaster for the nation. As the meeting came to a close, a powerful thunderstorm cut loose on the lingering protesters and the attendees alike as they rushed for their cars. In the flash of massive thunderbolts, the two groups became one, trying in vain to stay out of the rain. Wade Goodwyn, NPR News, Dallas. (SOUNDBITE OF RYAN HELSING AND MATTHEW SETZ'S "LAYERS") Transcript provided by NPR, Copyright NPR.